Bhind is one of the few places in Madhya Pradesh which remain unknown to tourists and travellers despite housing numerous places of interest, ranging from ancient temples to majestic forts. However, over a period of time, it has become popular amongst local tourists and offbeat travellers. Thereby, increasing tourism in the area. Have you ever been to Bhind? If not, then you must catch a glimpse of this ancient settlement which is also considered as a sacred place due to the presence of several temples and its connection with the epic Mahabharata. It has also been home to several great personalities in the past. Hence, Bhind is place of historical as well as religious importance. So, what do you think of a trip from Bhopal to Bhind this weekend? If you are history lover, then you should not miss out on this ancient beauty. Located in the state of Madhya Pradesh and touching the border of Uttar Pradesh, Bhind experiences an extreme type of climate and hence, it is not a preferred destination for local tourists during the summer season. However, it remains an offbeat stoppage for travellers and history lovers. If you desire to escape the summer heat of Bhind, then the best to visit is from October until the end of February. By Air: You can take a direct flight to Gwalior airport and then from there you can hire a cab to Bhind, which is located at a distance of about 70 km from the airport. You can also take a bus from the Gwalior city to Bhind. By Rail: There are no direct trains available between Bhind and Bhopal. However, you can catch a train from Bhopal to Gwalior and then from there you can either hire a cab or take a bus to Bhind. By Road: Bhind is well connected to nearby cities and towns by road and hence, it is easily accessible. It is located at a distance of about 500 km from Bhopal and can be reached in an average time of 10 h.
As route 1 is the fastest and will take an approximate time of 9 h to reach Bhind, it is preferable. On your way, you can also visit Sanchi and Jhansi and explore their surroundings. You must take a break at Sanchi while on your way to Bhind if you love visiting and exploring ancient marvels. Sanchi is located at a distance of about 50 km from Bhopal and 430 km from Bhind and is famous amongst tourists for its Buddhist complex, which houses Sanchi Stupa, one of the greatest stone structures in India. Built atop a hill, Sanchi Stupa is believed to have been built during the Mauryan Era thousands of years ago. Hence, it is a perfect place around Bhopal to learn about the history of Madhya Pradesh. From beautiful architraves to intricate patterns, each and every corner of Sanchi Stupa deserves to be explored. Who can forget the revolt of 1857? Whenever the talk is about the struggle from Indian independence, Jhansi has to be mentioned somewhere on account of the bravery of Rani Lakshmi Bai, who was one of the prominent freedom fighters during the uprising. So, why not get yourself to this ancient town of Rani Lakshmi Bai and learn in detail about its past and India's glory? Jhansi is located at a distance of about 340 km from Bhopal and 160 km from Bhind. The major places to visit here include Jhansi Fort, Karguanji Jain Temple, Government Museum, Rani Mahal and the Tomb of Gangadhar Rao. Bhind is said to be one of the oldest places in Madhya Pradesh and hence, it is a spot of historical significance. According to Hindu mythology, it is the place where several sages took samadhi and a few deities prayed. Even though there are not many places for common tourists to explore within its boundaries today, it is still a spot which deserves to be studied by travellers and history lovers. Following are the places which you should not miss visiting while in and around Bhind. 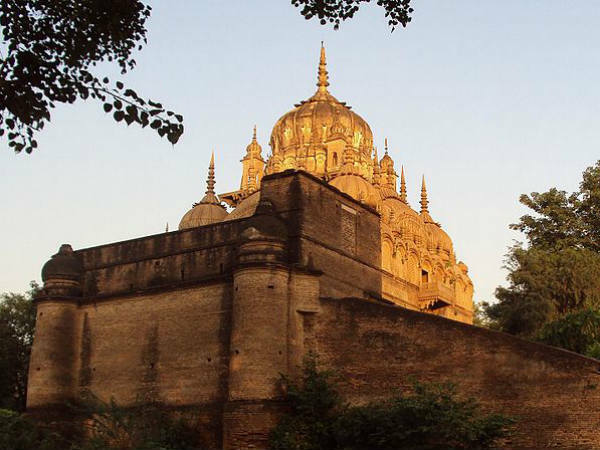 Being a historical site, Bhind is said to have been ruled by several dynasties over a period of time, ranging from the kings of the Vedic period to the Rajput kings of the 18th century. Hence, you can find several ancient buildings in the form of forts here. The major forts include Gohad Fort and Ater Fort. Ater Fort is settled by the Chambal river and was built during the 17th century by the Bhadouria kings of the region. Gohad Fort is a 16th-century fort built by Maha Singh, a Jat king, and is currently serving as the office of state government. How can an ancient site in India be free of temples? Bhind, too, is dotted with several temples from the past. The major temples here include the Jain temples of Barason, Shri Rawatpura Dham, Mata Renuka Temple, Narad Dev Temple, Dandraua Temple and Jamana Wale Hanuman Ji. Pachnada is a beautiful place on the border of Madhya Pradesh and Uttar Pradesh and is the confluence of five rivers, namely Kwari, Pahuj, Sind, Chambal and Jamuna. As the area is rich in greenery, it attracts several photographers too. You can also get to witness the beauty of dolphins in the waters here. Apart from all these places, you can also visit other places of interest which include National Chambal Wildlife Sanctuary, Sun Temple, Chhatri of Malhar Rao Holkar and Vankhandeshwar Temple.